Cornerstone receives “Highest Average Score” in transferee/assignee satisfaction in the entire industry which includes both the large and small company categories. 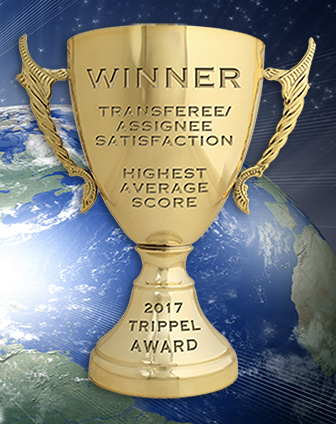 Cornerstone is pleased to announce the first-place win of the 2017 Trippel Survey Award for “transferee/assignee satisfaction”. Cornerstone received the highest average score in the entire industry which includes both the large and small company categories. The 23rd annual Nationwide Relocating Employee Survey is one of three surveys Trippel Survey & Research, LLC conducts each year in the global mobility industry (the other two survey domestic and international managers). The annual nationwide relocating employee survey is designed to obtain unbiased evaluations from transferees or assignees moving within the United States, regarding their level of satisfaction with relocation service providers. This year, 6,647 transferees, representing 89 corporations or non-profit organizations, participated in the web-based survey. For information on obtaining copies of the Trippel Survey & Research, LLC reports referenced here, contact Alan Trippel at alantrippel@att.net.